If certain arguments generate the conclusion that it is wrong to eat farmed animals, do they also generate the conclusion that it is wrong to eat animals’ period? Sometimes, a day in the garden can have a double-barreled climax. I have just had one of the best. Recently while on a visit to my in-law’s new residence in the beautiful Maasai Peninsula of Kitengela, as the light faded into the evening I found myself looking at their vernacular-art-like garden of Sukuma Wiki (collard greens - part of the Brassica Oleracea family of vegetables) and feeling obliged to admit that although it lacked an exceptional style, it was nevertheless an organic bliss. Sukuma Wiki has been a favorite veggie in East Africa for more than 2000 years. Nothing, indeed, beats eating fresh vegetables straight from the garden. Hours later, through a captivating new book ‘The Moral Complexities of Eating Meat’ (2016) by Ben Bramble and Bob Fischer (editors), I was transported to the nyama choma planet, a hidden world of equal wonder. 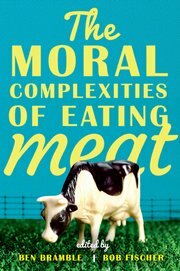 Bramble and Fischer’s new book reaffirms that the ethics of eating meat is still a hot matter. Indeed many things food-philosophical still are. The book contains twelve essays with a short introduction from the editors. Some of the essays are orthodox. Some of them are heterodox. Even the most orthodox, familiar pieces are full of striking insights and ideas for new directions. It contains sharp, riveting asides about anti-natalism, bug-eating, comparative accounts of harm, duties to pets and prey animals, and so on. The book’s idea is said to have arisen from a “write-your-best-defense-of-meat-eating” competition in the New York Times, where the book’s editors Ben Bramble and Bob Fischer participated and were finalists. It is divided into three parts: Defending Meat, Challenging Meat, and Future Directions. Defending Meat is the shortest. In it, Christopher Belshaw defends the permissibility of killing animals for food by defending the view that death is not bad for them. He argues that, for most adult farm animals, even those living on a free-range farm, life is a grinding, mindful monotony, interrupted by occasional pains. (Young animals, he thinks, have happier, richer lives.) Killing such animals isn't wrong. And then neither is eating them. This book, although not specifically written with the African carnivorous audience in mind, offers an appetizing sociological account of food politics, contemporary patterns of cultural identity, and the effect of meat-eating as an informal hypothesis of unity that can be useful in a country such as Kenya, whose metaphoric ‘man eat man’ greasy politics are well documented. Everything from crocodile to ostrich meat is considered fair game in Kenya, nyama choma, Swahili for “grilled meat” is tasty barbecue meat stripped down to its raw elements. That said, it is the Kenyan purist creature that really makes a meal of it all. He is generally known to stick to mbuzi choma (goat) both for its gutsy flavour and slight chewiness. He would often ensure that there are no sticky-sweet glazes in his favorite meal, just plenty of smoke, fire and, of course, hulking portions of bone-in meat. Nyama choma remains undoubtedly Kenya’s most celebrated dish loved in equal measures by the rural masses and elites of the metropolitan circles. Straddling the equator, Kenya remains a geographic and cultural marvel. Its nyama choma sector involves a complex and dynamic supply chain with a considerable number of small, medium and large business activities centred on meat production. Historically, nyama choma activities originated from the customs and traditions of the pastoral people such as Kitengela’s Maasai community. Nyama choma as a business began at the livestock market places, taking advantage of the readily available market - since market days would occur only once or twice a month, people would often attend in large numbers. Indeed, this was the only easy way of providing food to the buyers and sellers at remote livestock markets. Because of the popularity of the product, the business of nyama choma soon expanded beyond the livestock market. Today these activities are found in almost all urban and trading centres in Kenya. Kenya’s nyama world aside, Bramble and Fischer’s book raises important arguments about food production. Although, admittedly, there is comparatively little in the book about eating as opposed to buying or producing food. Indeed with the exception of Belshaw's and Callicott's papers all of the other papers in the book are critical of contemporary meat production. That said, interesting questions have been raised, for instance, how do we generate conclusions about consumption based on the raising and killing of animals? Donald Bruckner’s questions goes further: If certain arguments generate the conclusion that it is wrong to eat farmed animals, do they also generate the conclusion that it is wrong to eat animals’ period? Do such arguments get quite a bit further than a requirement not to eat certain sorts of animals? Do they get as far as a requirement not to eat certain sorts of vegetables, namely, those produced using methods that kill animals or destroy animal habitat or are produced in ways that are environmentally destructive, he wonders. Needless to say, Challenging Meat is the book's longest section, though not entirely because the challenges to meat are lengthy. Some of the most interesting work has quite frankly nothing to do with that challenge. For example, the argument that “it is wrong to raise certain animals for food”. Hence, “it is wrong to buy or eat such animals” is clearly invalid. Ben Bramble leads the canonical crusade against meat, especially arguing that ‘it costs animals so much and gains us so little’. He works through four objections to it, developing each and then arguing against it, including a bit where he takes the standard "But giving up meat would be such a great cost to me!" objection to it and turns it on its head, arguing that eating meat costs us a great deal psychologically. Appreciably, Tristram McPherson invites a familiar omnivorous response to Bramble's arguments and the like by pointing out that it's perfectly acceptable to eat meat. In the last section of the book, titled ‘Future Directions’, Alexandra Plakias argues that debates between vegetarians and omnivores of the sort discussed in the book might fruitfully be thought of as debates about what counts as food rather than debates about which foods we may eat. She argues, too, that these debates might be fruitful even if they do nothing to change any minds about the permissibility of meat-eating. Likewise, Bob Fischer argues that blaming people for eating meat might be counterproductive and also arbitrary and unmotivated. And it's arbitrary to single out meat-eating out as a thing to blame. So much needed moral music to the nyama choma choir… Did I hear someone sing, burn baby burn! Ronald is the Executive Director of Grundtvig Africa House, Nairobi, Kenya.